Clicking on any entry in the glossary will bring up an image in the window below that will illustrate the actual structure. Clicking on any hypertext appearing in any of the definitions will bring up that term's glossary entry in this window. ACULEUS. The sting or stinger. A hollow, needle-like, terminal spine used for injecting venom into the prey or would-be predators. A pair of VENOM DUCTS leads from the VENOM GLANDS to paired openings near the tip of the ACULEUS. Syn. = STING. BASITARSUS. The sixth segment of the walking LEG. It is located on the walking LEG between the TIBIA and TELOTARSUS. Pl. = BASITARSI. Syn. = TARSUS or TARSOMERE I. BOOK LUNG. Paired respiratory organs located in MESOSOMAL SEGMENTS III-VI. The structures are comprised of numerous thin folds of cuticle projecting into the body of the scorpion. These thin folds allow gas exchange between the scorpion's blood and the atmosphere. Together, the folds look like the pages of a book, hence the term BOOK LUNGS. Each book is enclosed within a chamber (ATRIUM) that opens to the atmosphere through a hole (SPIRACLE) in the MESOSOMAL STERNITE. Most scorpions have four pairs of BOOK LUNGS. The earliest fossil scorpions are thought to have had five pairs of BOOK LUNGS. Still other fossil scorpions may have had only three pairs. CARAPACE. The large, single sclerite covering the dorsum of the CEPHALOTHORAX or PROSOMA. CHELA. A structure comprised of the TIBIA and TARSUS of either the CHELICERA or PEDIPALP. A claw-like structure consisting of a MANUS, FIXED FINGER, and MOVABLE FINGER. CHELICERA. A paired, three-segmented appendage arising from PROSOMAL SEGMENT I (SOMITE III). The CHELICERAE are modified for feeding and grooming. Pl. = CHELICERAE. COXA. The first, or proximal-most, segment of a prosomal appendage. It is located on the CHELICERA before the CHELA, and on the PEDIPALP and walking LEG before the TROCHANTER. Pl. = COXAE. DACTYL. The median claw of the PRETARSUS of the walking LEG. Syn. = MEDIAN CLAW. FEMUR. The third segment of the PEDIPALP or walking LEG. Located on the PEDIPALP or walking LEG between the TROCHANTER and PATELLA. Pl. = FEMORA. FIXED FINGER. The apical extension, or non-articulated finger, of the TIBIA (CHELA) of either the CHELICERA or the PEDIPALP. FURROW. Any of the "valleys" occuring on the integument of the scorpion. These features are usually associated with internal APODEMES or ridges that project into the body. GENITAL OPERCULUM. One of a pair of sclerites located ventrally on MESOSOMAL SEGMENT I (SOMITE X) that covers the GENITAL APERTURE of the scorpion. The sclerites may be completely separated or fused to varying degrees along the midline. Pl. = GENITAL OPERCULA. GENITAL SEGMENT. See MESOSOMAL SEGMENT I. KEEL. Any of the "ridges" occuring on the integument of the scorpion. These features represent structural thickenings of the exoskeleton associated with stress points. Syn. = CARINA. LATERAL EYES. A pair of degenerative compound eyes that are located at the anterior corners of the CARAPACE. Each LATERAL EYE is typically represented by two to five separate lenses. Syn. = LATERAL OCELLI. LATERAL OCELLI. See LATERAL EYES. LEG. Paired, eight-segmented appendages arising from PROSOMAL SEGMENTS III-VI (SOMITES V-VIII). Some workers consider the arachnid leg to be seven-segmented with the BASITARSUS and TELOTARSUS representing TARSOMERES or pseudosegments, and thus counting as a single segment. The LEGS are numbered I-IV, anterior to posterior. They are used primarily for locomotion, but may also be used for digging, mating, or birthing young. MANUS. The thick, segmental part of the TIBIA (CHELA) of either the CHELICERA or PEDIPALP. Syn. = HAND, PALM. MAXILLARY LOBES. Anterior extensions of the COXAE of LEGS I and II that form the floor of the PREORAL CHAMBER. Syn. = COXAPOPHYSIS, ENDITE. MEDIAN EYES. A pair of simple, vitreous eyes that are located near the middle of the CARAPACE. MESOSOMA. The broad, anterior division of the OPISTHOSOMA corresponding to SOMITES X-XVI. The MESOSOMAL SEGMENTS are numbered I-VII, anterior to posterior. Syn. = PREABDOMEN. MESOSOMAL SEGMENT. One of the segments of the MESOSOMA (SOMITES X-XVI). The MESOSOMAL SEGMENTS are numbered I-VII, anterior to posterior. MESOSOMAL SEGMENT I. The first segment of the MESOSOMA (SOMITE X). MESOSOMAL SEGMENT I is the GENITAL SEGMENT. It bears the GENITAL APERTURE, GENITAL OPERCULA, and PECTINES ventrally. MESOSOMAL TERGITE I also corresponds to this segment. Syn. = GENITAL SEGMENT. MESOSOMAL SEGMENT II. The second segment of the MESOSOMA (SOMITE XI). MESOSOMAL SEGMENT II is not visible ventrally. Early fossil scorpions exhibited a STERNITE on this segment. MESOSOMAL TERGITE II corresponds to this segment dorsally. MESOSOMAL SEGMENT III. The third segment of the MESOSOMA (SOMITE XII). This segment is covered by a TERGITE dorsally and a STERNITE ventrally, however, some fossil scorpions lacked a STERNITE on this segment. This segment bears a pair of BOOK LUNGS. MESOSOMAL SEGMENT IV. The fourth segment of the MESOSOMA (SOMITE XIII). This segment is covered by a TERGITE dorsally and a STERNITE ventrally, and bears a pair of BOOK LUNGS. MESOSOMAL SEGMENT V. The fifth segment of the MESOSOMA (SOMITE XIV). This segment is covered by a TERGITE dorsally and a STERNITE ventrally, and bears a pair of BOOK LUNGS. MESOSOMAL SEGMENT VI. The sixth segment of the MESOSOMA (SOMITE XV). This segment is covered by a TERGITE dorsally and a STERNITE ventrally, and bears a pair of BOOK LUNGS. MESOSOMAL SEGMENT VII. The seventh segment of the MESOSOMA (SOMITE XV). This segment is covered by a TERGITE dorsally and a STERNITE ventrally. This segment is much longer than the preceding segments and tapers noticeably to its junction with the METASOMA. MESOSOMAL STERNITE. Any of the ventral sclerites of MESOSOMAL SEGMENTS III-VII. The MESOSOMAL STERNITES are numbered III-VII, anterior to posterior. Syn. = STERNITE. MESOSOMAL TERGITE. Any of the dorsal sclerites of MESOSOMAL SEGMENTS I-VII. The MESOSOMAL TERGITES are numbered I-VII, anterior to posterior. Syn. = TERGITE. METASOMA. The narrow, posterior division of the OPISTHOSOMA corresponding to SOMITES XVII-XXI and the TELSON. The METASOMAL SEGMENTS are numbered I-V, anterior to posterior. Syn. = CAUDA, POSTABDOMEN. METASOMAL SEGMENT. Any one of the five segments of the METASOMA. The METASOMAL SEGMENTS are numbered I-V, anterior to posterior. The TELSON is not considered a true segment, but rather a tergal spine of METASOMAL SEGMENT V.
METASOMAL SEGMENT I. The first segment of the METASOMA. METASOMAL SEGMENT II. The second segment of the METASOMA. METASOMAL SEGMENT III. The third segment of the METASOMA. METASOMAL SEGMENT IV. The fourth segment of the METASOMA. METASOMAL SEGMENT V. The fifth segment of the METASOMA. MOVABLE FINGER. The articulated finger of the CHELA of either the CHELICERA or the PEDIPALP. The terminal segment of either the CHELICERA or the PEDIPALP. Syn. = TARSUS. OPISTHOSOMA. The posterior tagma of the body composed of SOMITES X-XXI. The OPISTHOSOMA begins with the GENITAL SEGMENT and includes all POSTGENTIAL SEGMENTS. 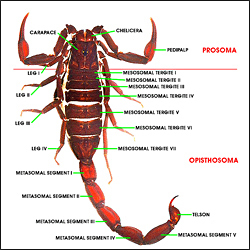 In scorpions, the OPISTHOSOMA is divided into a MESOSOMA and a METASOMA. The OPISTHOSOMA carries on the functions of respiration, reproduction, and digestion. Syn. = ABDOMEN. PATELLA. The fourth segment of the PEDIPALP or walking LEG. The PATELLA is located on the PEDIPALP or walking LEG between the FEMUR and TIBIA. Pl. = PATELLAE. PECTEN. One of the paired comb-like appendages located ventrally on MESOSOMAL SEGMENT I just posterior to the GENITAL OPERCULA. The PECTINES are sense organs that contain mechanoreceptors and chemoreceptors. Pl. = PECTINES or PECTENS. PEDIPALP. Paired, six-segmented appendages arising from PROSOMAL SEGMENT II (SOMITE VI). The TIBIA and TARSUS of the PEDIPALP form a powerful CHELA. The PEDIPALPS are used in prey capture, feeding, mating, and defense. They also carry a large number of sensory receptors. POSTGENITAL SEGMENT. Any body segment posterior to the GENITAL SEGMENT. Any segment of the OPISTHOSOMA except for the GENITAL SEGMENT. POSTERGITE. The portion of the MESOSOMAL TERGITE posterior to the TRANSVERSE KEEL. PREGENITAL SEGMENT. Any body segment anterior to the GENITAL SEGMENT. Any segment of the PROSOMA. PRETARSUS. The eighth segment of the walking LEG. It is located distally on the walking LEG after the TELOTARSUS. It bears the UNGUES and the DACTYL. Pl. = PRETARSI. Syn. = APOTELE or POSTTARSUS. PRETERGITE. The portion of the MESOSOMAL TERGITE anterior to the TRANSVERSE KEEL. PROSOMA. The anterior tagma of the body comprised of SOMITES I-IX. The PROSOMA is made up of all the PREGENITAL SEGMENTS and includes the "head" (mouth, pharynx, eyes, brain, etc. ), CHELICERAE, PEDIPALPS, and LEGS. The PROSOMA functions in locomotion, prey capture, feeding, mating, and sensory perception. Syn. = CEPHALOTHORAX. SOMITE. Any of the primordial segments of the body. A body segment. Some somites are visible only at early stages of development, e.g., the clypeolabral and antennal segments in chelicerates. The SOMITES are numbered I-XXI, from anterior to posterior. SPIRACLE. An opening in the MESOSOMAL STERNITE that permits gas to flow between the outside environment and the ATRIUM of the BOOK LUNG. STERNUM. A median sclerite located ventrally on the PROSOMA between the COXAE of LEGS III and IV, just anterior to the GENITAL OPERCULA. The sternum may be formed from remnants of SOMITE IX and may therefore be homologous with the CHILARIA of xiphosurids and and the metastoma of eurypterids. SUBACULEAR TUBERCLE. A short spine or denticle sometimes present ventrally at the base of the ACULEUS. Syn. = SUBACULEAR TOOTH. SUBACULEAR TOOTH. See SUBACULEAR TUBERCLE. TARSUS. The movable, or articulated finger, of the CHELA of either the CHELICERA or the PEDIPALP. The terminal segment of either the CHELICERA or the PEDIPALP. Syn. = MOVABLE FINGER. Also sometimes refers to the BASITARSUS, or BASITARSUS and TELOTARUS collectively, of the walking LEG. TELOTARSUS. The seventh segment of the walking LEG. It is located on the walking LEG between the BASITARSUS and PRETARSUS. Pl. = TELOTARSI. Syn. = TARSOMERE II. TELSON. A highly modified tergal spine of METASOMAL SEGMENT V. It is the posterior-most structure on the scorpion's body. The TELSON houses the VENOM GLANDS and bears the ACULEUS. TIBIA. The fifth segment of the walking LEG, or the thick, segmental part of the CHELA of either the CHELICERA or PEDIPALP. TRICHOBOTHRIUM. A specialized sensory seta designed for detecting vibrations in the air. The TRICHOBOTHRIUM consists of a cup-like base (the "bothrium") and a long, uniformly thin hair (the "trich"). TRICHOBOTHIA are found only on the FEMUR, PATELLA, and TIBIA of the PEDIPALP. Pl. = TRICHOBOTHRIA. TROCHANTER. The second segment of the PEDIPALP and walking LEG It is located between the COXA and the FEMUR. UNGUIS. One of the paired submedian claws of the PRETARSUS of the walking LEG. Pl. = UNGUES. Syn. = TERMINAL CLAW. VENOM DUCT. One of the paired, internal tubes leading from the VENOM GLANDS to the paired openings near the tip of the ACULEUS. VENOM GLAND. One of the paired, internal sacs found in the VESICLE. The walls of these organs are lined with glandular tissue that secretes the various components of the scorpion's venom. VESICLE. The globular protion of the TELSON anterior to the ACULEUS. The VESICLE contains the paired VENOM GLANDS.